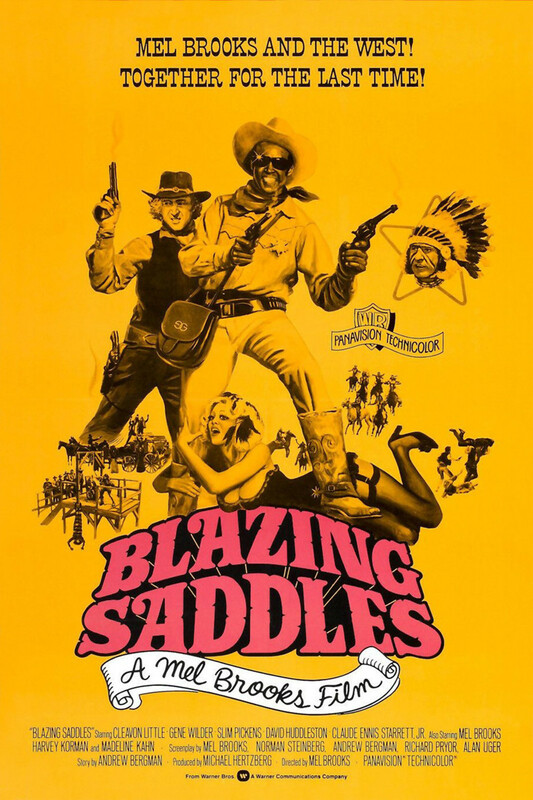 Blazing Saddles is an old west comedy directed by Mel Brooks that takes a light hearted look at racism, bigotry and stereotypes and throws them out the window. The town of Rock Ridge needs a new sheriff and they are sent one in the form of Cleavon Little (Bart), an African American man who is saved from hanging and appointed the new lawman there. Magistrate Harvey Korman figures the people will kill him anyway, but the new sheriff bluffs his way out of the lynch party and befriends the Cisco kid played by Gene Wilder. Together they manage to concoct a plan to save the town from Korman’s gang, lead by Slim Pickens who is so racist and stupid that he consistently underestimates his opponent’s abilities. The climactic scene involves a complete destruction of a make believe mock up of the town, with a spilling over into many Hollywood sets including a dance number directed by Dom Deluise. The evil Korman get his in the final shot before Bart and Cisco ride off into the sunset.